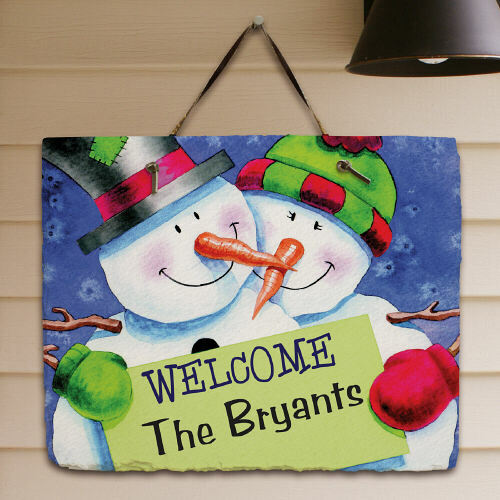 Personalized Snowman Christmas Welcome Slate Plaque. Display your family name in style with a Slate Plaque with a beautiful snowman theme design. Imagine what people will say when they see your fancy new slate plaque in front of your home or resort or cabin around Christmas time. Give them something to talk about while they wait at the door. The slate Plaque will be the talk of the day and your entrance will be beautiful. Slate Plaque can be hanged on the wall inside of home or out side of home, cabin, resort, vacation home. The Slate Plaque is the prefect gift for any one: mom, grandpa, grandma, auntie, or other family members as a Christmas gift.